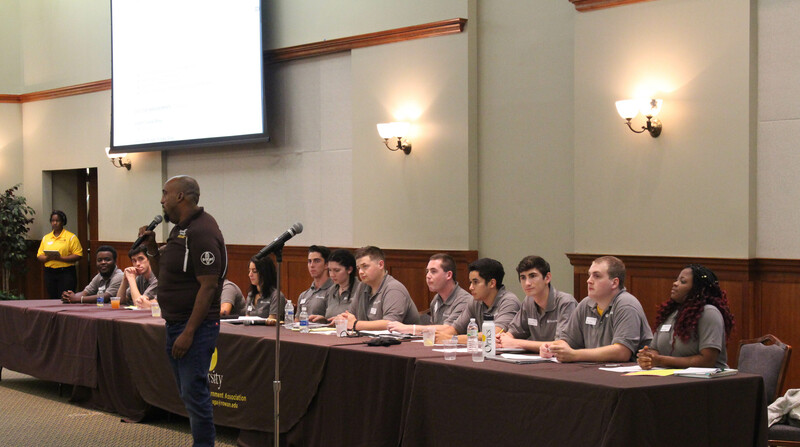 The Rowan Student Government Association (SGA) convened on Monday for its first meeting of the new semester. Dean of Students Richard Jones spoke to the student body in open session at the beginning of the meeting. In his remarks, he mentioned that the school was working with Nexus to address issues brought up in an editorial from last week’s Whit. Asked for comment after the meeting, Jones said that the question and answer session that followed was meant to clear up any potential confusion that the student body might have had regarding the new housing. “What I wanted to do is make sure that students were aware that the university was on top of it, and that we’re in communication with Nexus Properties,” Jones said. Jones also said that many of the issues were a result of the building being new. He said that Nexus was continuing to work out bugs and kinks in buildings, while comparing the situation to moving into a new home. Also speaking in the open session was Melissa Ulmer, assistant director for the Chamberlain Student Center and Campus Activities. She noted that homecoming’s theme this year was a nod to a new acquisition by the school. Other business attended to at the meeting dealt with the reconstructing of Student Financial Control Board (SFCB). Chief Financial Officer Robert O’Leary said that reconstructing the board would lead to positive results. “So we’re going from five members to nine members, just so that we can have a more diverse group of voters in there,” O’Leary said. He also added that the SFCB would be removing the max limit of the fund balance, the amount of money the SGA rolls over from year to year. O’Leary said that he felt it would benefit the student body overall to do this. “If this is money that we’re saving up to invest to better student life, what benefit does a maximum [cap] have,” O’Leary said. The next meeting of SGA senate will convene Oct. 2 at 7:00 p.m.